Do occult practices contribute to the health of my pear trees? After all, there I was, clomping through lily-white snow in boots tossing what looked like puffs of smoke at each tree. As I moved from tree to tree, a gray halo settled to the ground arround each tree’s base. Yes, those puffs of smoke would be contributing to my pear trees’ well-being. No, all that puffing was not occult, not even really smoke, in fact. The stuff was wood ashes, and I had three reasons for what I was doing with it. First and foremost, I was disposing of it. Wood ash is rich in potassium and alkalinity. Potassium is an essential nutrient for plants, and alkalinity is good to counteract the increasing acidity of our soils, where rainfall constantly washes out its alkalinity. But too much of a good thing is a bad thing. My woodstove generates a panful of ashes every couple of days or so, and too much wood ashes on the ground causes an imbalance of nutrients in soil and plants, especially of magnesium, another essential nutrient. Too much wood ashes in one place would also make the soil too alkaline, which brings on deficiencies of yet more essential plant nutrients, such as iron and phosphorus, lessens the soil’s ability to hold onto nutrients for later use by plants, and can increase plant susceptibility to certain diseases, such as potatoes, to scab. So I spread my wood ashes far and wide, at a rate where their goodness does good. The minerals in wood ashes, and its dark color, have another use under my pear trees. It melts snow. I like snow as much as any child but mice, free from the gaze of predators, run amok beneath that white blanket, stopping to gnaw on bark. A few inches of snow also give rabbits a leg up to reach higher into young trees to do similar work on what were low branches. That gray halo eats away at snow near the base of each tree. In throwing that ring of wood ashes at the base of each tree, some inevitably clings to bark and branches. If I were a rabbit, a dusting of wood ashes would make a meal of bark or branches less appetizing. Perhaps they feel that way, too. Anyway, that’s my third, neither occult nor particularly well-founded, reason for those puffs of “smoke” and halos of gray around each of my pear trees. Winter has finally come. Besides all the beautiful, white snow, we finally have some cold. 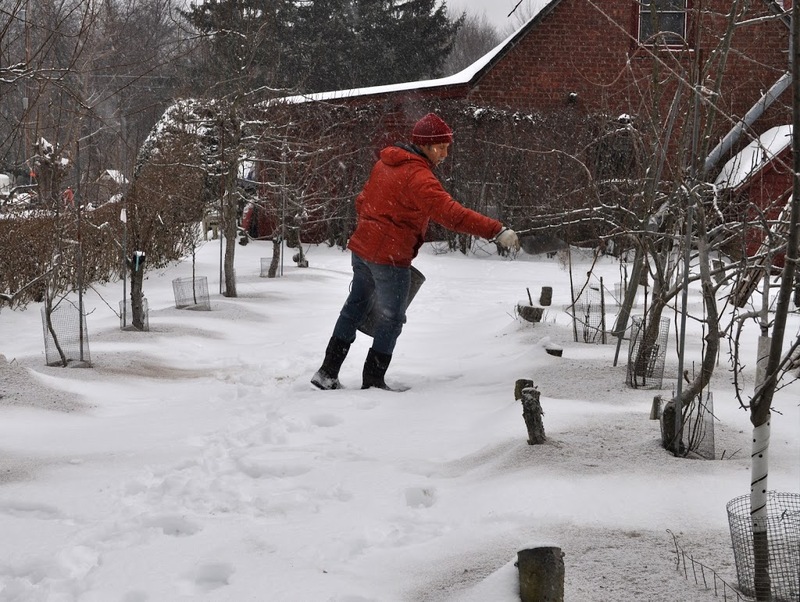 I’m keeping a close eye on how cold it gets, as should any good gardener, farmdener, or farmer, because the depth of cold is one determinant of what plants I can grow and how those I do grow might fare in the coming season. 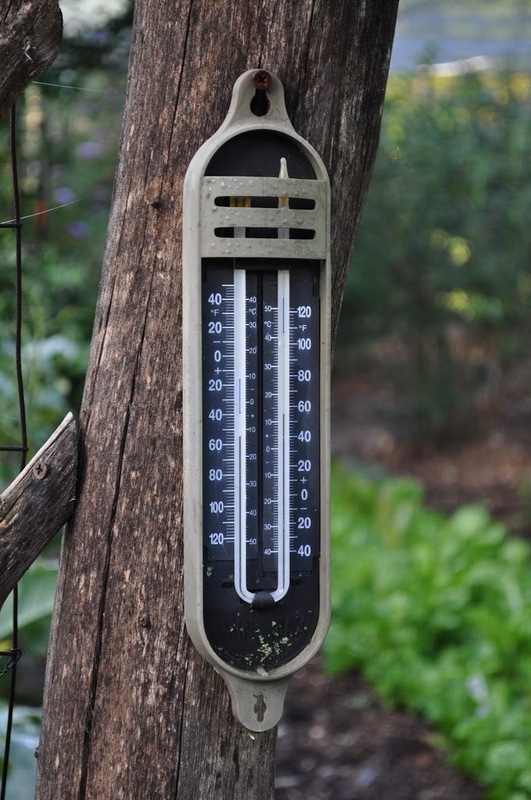 Noting the temperature at 9 o’clock in the morning from a thermometer suction-cupped to the kitchen window or hanging on a post on the back porch will not do. Temperatures usually plummet to their lows around 4 or 5 in the morning, and by 9 a.m. have already risen a few degrees, especially on sunny days as days grow longer. Also, a thermometer sheltered beneath the roof of the front porch or house wall catches some indoor heat radiating out a window or wall so reads warmer than one hanging out in the garden near plants. I’m not recommending anyone padding out on the snow to the garden in their slippers at 4 a.m. each morning to get an accurate temperature reading for the next few weeks. (Coldest temperatures usually arrive within a month on either side of the end of January.) Modern technology comes to the rescue in the form of minimum/maximum thermometers. Minimum/maximum thermometers come in two “flavors”: mechanical and digital. Mechanical min/max thermometers have two sliding indicators that are pushed by either the temperature-reading needle of a dial thermometer or by the expanding fluid in a liquid in glass thermometer. One indicator stays where it is pushed to its high point, the other at its low point. High and low temperatures are indicated for the period since the sliders were last reset by being slid back against the needle or fluid. Digital min/max thermometers work by . . . who knows? They do essentially the same thing as the mechanical min/max thermometers, except are reset with a push of a button. One advantage of digital thermometers is that some can transmit readings wirelessly indoors. I read the minimum, maximum, and present temperatures from the warmth of my bedroom while still in my pajamas. Still, mechanical thermometers are reassuringly simple and reliable. I have both kinds. No need to reset a minimum/maximum thermometer every single day. Once, at the beginning of winter, suffices for knowing the ultimate depth of cold for the season. This entry was posted in Uncategorized and tagged thermometer, wood ash. Bookmark the permalink. Trackbacks are closed, but you can post a comment. So, how cold has it gotten? In Madison, WI, I don’t think we’ve seen -10 degrees F yet. I remember the last winter I spent in Madison the temperature never went above 0°F day or night! Lows at night were about minus 30. Here in the Hudson Valley, we used to get minus 20 or 25 regularly, but not in recent years. This winter’s low, so far, has been around 9°. For the past few weeks, it’s hardly gotten below the ‘teens. For the wireless digital thermometer, the package includes the sending unit (which goes out in the garden) and the receiving unit (which is indoors). Some models have more than one sending unit and each can be read independently on the receiving unit. I think I got mine at Amazon but you should find plenty of sources by googling something like “digital wireless thermometer.” Mine is a Taylor which also records high and low temperatures. Whitman Farms is a good mail order source for currants, both kinds. Currants should do well north of SF. You have a lot of microclimates in that region so that could vary with just where you are.